The war for talent is on and everything counts. By providing a central gathering place, such as a café, the workplace can intentionally encourage the breakdown of silos. Years ago, we worked with a very large insurance firm that was seeking to refresh and renew its culture. They were also trying to attract the best talent. They would regularly interview prospective candidates at their recently redesigned Michigan facility even though they were hiring the new employees to work at their facility in the southern US. The facility was significantly outdated and, some might even say, felt rather life-sucking. It was a true bait and switch. Needless to say, their turnover rate within the first year was high. The good news was the company recognized the power of place and its connection to attracting talent. The bad news was they weren’t putting action behind their beliefs across multiple facilities fast enough to make a difference. Changing postures is physically engaging, mentally stimulating and helps people stay refreshed and engaged. Offering a variety of postures, be it standing, sitting or lounging, supports the wellbeing of people. Place is one of the most visible artifacts of culture. While candidates largely have to take potential employers at their word in terms of leadership style, work content and company belief systems, the place tells a clear story about the company in terms of how work is accommodated, what resources are available, how the company communicates its approach and what the company values. This explicit nature of place is what makes it such a powerful lever. Greater than 60 million Baby Boomers will leave the workforce by 2025 and only 40 million new workers will enter according to one study. In addition, the study reports employment in technical, professional and scientific roles will grow 29 percent by 2020. This increase will add more than two million new jobs to the US economy. According Glassdoor, 76 percent of hiring decision makers say attracting quality candidates is their primary challenge. One of the strategies that companies are employing is to provide plenty of benefits. In a recent SHRM (Society for Human Resource Management) study, HR professionals reported on the benefits that would grow in strategic importance for the recruiting process. Sixty-two percent of HR professionals believe professional and career development will grow, 53 percent believe flexible work schedules will be critical and 50 percent believe wellness and preventative care will be differentiating in attracting top talent. Each of these has a connection to place, of course. Professional and career development will be important to top talent as they select new firms. but, it will also be important to companies’ success. According to a study, 60 percent of all new jobs in the 21st century will require skills only 20 percent of the workforce possesses. 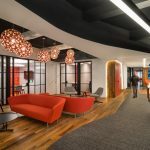 A touchdown space like this one creates a comfortable place to connect with customers, leaders or colleagues without people feeling like they are intruding on the team’s space. Development is facilitated by a place where people can connect and learn from each other in formal settings (conference rooms, classrooms, learning centers) as well as in informal settings such as work cafes or other central gathering areas like town squares. The opportunities to connect in unplanned meetings, ask questions and overhear discussions provide for learning among teammates and colleagues. Leadership too, has a role to play. When leaders are present and accessible in spaces that are integrated on a floor or in relative proximity to a team, people have a greater opportunity to network and learn from leaders directly. Leaders who work in close proximity to each other and their teams encourage collaboration even at the highest level of the organization. Flexible working is also important according to HR recruiters. While flexibility in schedules is a part of this, so too is flexible working accommodations in the physical environment. In a Steelcase global study, we found a correlation between choice and engagement. Providing a palette of place and a broad ecosystem within which people can choose to work all contribute to a workplace where people are more highly satisfied at work and beyond that, attracts talent. In addition, place plays a role in bringing people to the office. People crave connection and there is a resurgence in the desire for face-to-face communication – with people recognizing it is more important than ever. In fact, employees who spent 15 minutes socializing with coworkers during their workday exhibited a 20 percent performance boost. Attractive, stimulating and comfortable areas contribute to an employee’s desire to be present in the office. Shared spaces promote informal collaboration and connections. Finally, HR recruiters see the increasing importance of health and wellbeing in the process of attracting new talent. Place has a crucial role to play here as well. One of our recent lessons learned is the more intense people’s work, the more they need time away for respite, reflection and refresh. This was especially evident as we worked with developers in agile environments and with not-for-profit teams at companies solving some of the world’s most challenging problems. And, it holds true for all intense work. Consider the use of green/biophilic spaces, cafes offering fresh foods, and garden areas that serve both individuals and groups. Also consider wellness hubs, napping rooms and services such as massage or health assessments. These kinds of place-based solutions can have a significantly positive impact on the overall work experience. Great talent is in high demand. The war to attract it and keep it is on. Everything counts in differentiating a company from its competitors and place is one of the most powerful levers it has. So, don’t fall into a bait and switch mentality. Instead, leverage place successfully and contribute to a victory in the battle to attract the best talent, creating great places in the process.